URL Profiler can access the Majestic API to extract link metric data such as Citation Flow, Trust Flow and the new Topical Trust Flow. 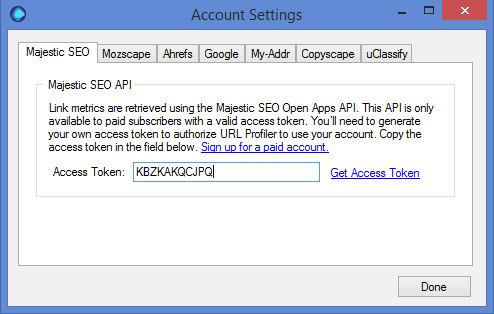 To use the API, you need to get OpenApp Authorisation, which requires a paid subscription. Head over to this page to get started. Login with your credentials and you will be taken to this page. Click ‘Grant Access’. You will be given your API key, which you need to enter into the Account Settings on URL Profiler (note that this API key will only work with URL Profiler).